The entire celebrations of Navratri festival centers around Fasting of devotees for Nine consecutive days. Know more on Navratri Vrat/Fasting procedure. Navratri Fast - Navratri festival is dedicated to the nine forms of Goddess Durga. The puranas and texts like 'Navratri vrat katha' stress on the importance of 'nirjal' (sans water) and 'nirahar' (sans food) 'vrat' or fasting during Chaitra and Ashwin months, through which a devotee can elevate his body and mind. Navratri vrat is, thus, one of the most sacred of fasting rituals among the Hindus. Navratri fast also ensures the devotee a long prosperous married life. The fast starts from the first day and carries on through the seventh or eighth day during Navratri. In the latter case, Navratri fast is broken on the ninth day or 'Navami'. For devotees who observe partial Navratri vrat, the ritual involves breaking fast after evening puja. The devotees abstain from consuming meat, fish, eggs, alcohol, onions, garlic, dishes made with common salt or any kind of spice. Some people live only on milk, fruits and fruit juices for the entire length of fasting. Apart from tea, coffee and milk, sago and potato cooked with rock salt are extremely popular dishes among devotees observing partial fast. Milk products and dry fruits can also be consumed. Navratri rules also imply watching one's temperament, actions and behavior. This is particularly aided by following a strict vegetarian diet. People take an early bath and dress in clean and fresh clothes. The devotee then proceeds to perform puja ritualistically. This comprises mantra chanting, lighting of diya or 'jyot', recitation of shlokas from Durga Saptashati and preparation and offering of 'prasad' made to Ma Durga or Mata Rani. As Navratri fasting rules apply to all devotees who observe partial fasting, food must be prepared without onions and garlic, as these ingredients are believed to induce negative vibrations. 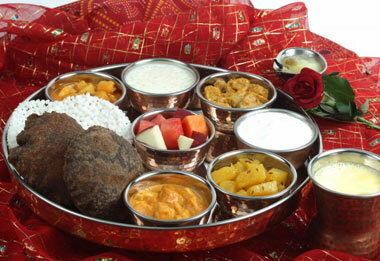 'Bhog' or 'Naivedyam' is then offered to Mata Rani or Goddess. During the day, bhajans are sung and then in the evening again, puja and 'aarti' are performed and 'prasad' offered to the Goddess. During the night, large groups of devotees participate in 'jagran' and remain awake the whole night singing 'bhajans' and 'hymns' dedicated to Ma Durga. It is also a common practice among some devotees to eat only one meal a day and that too, after performing the evening puja. Throughout the fasting period, apart from eating a vegetarian diet, devotees observe 'niyamas' like sleeping on the floor, not shaving or cutting nails and keeping away from recreational activities. The pious act of doing charity during this time is especially satisfying for the devotees. Normally, some devotees follow the practice of breaking their Navratri fast on the eighth day (Ashtami) and some on the ninth day (Navami). The procedure is to carry out 'Kanya' or 'Kanchika Pujan' wherein nine girls are worshipped and their feet washed. After this, they are treated to a spread of puri, halwa and chana and gifted handkerchief/clothes and money as a token. The nine 'kumari kanya', then, give blessings to the devotees observing Navratri vrat, after which they break their fast. On the ninth day, it is considered auspicious to offer 'dakshina' to the Brahmin. The most popular food preparations include Kuttu Ki Puri, Singhade Ka Halwa, Singhare Ke Pakore, Khuskhus Aloo, Sabudana Vada and Sabudana Khichdi. Some of the typical food ingredients to prepare these include Kuttu atta or buckwheat flour, Singhara atta, Sabudana or tapioca and foxnuts. During Navratri, markets are flooded with 'vrat' packaged snacks. For devotees observing Navratri fast, special Navratri 'thalis' offering an assortment of preparations are available in restaurants and eating joints.